Another good night’s sleep and then we went down to breakfast, where there was once again a great choice. The croissants were particularly tasty. After breakfast we paid the bill and then fetched the Velomobiles from the garage. Whilst we were installing our luggage a lady with child came to speak to us. Her accent sounded familiar to Klaus – yes she was a British woman. We had a bit of a chat about Brexit and crazy politics and living in Germany, she had been here for 11 years and was married to a German so fairly confident she could stay. This was our original plan route for today. However, because of the closed road yesterday we had taken the route that this track offered. This was the horrible sandy woodland track which I had to push Millie along. 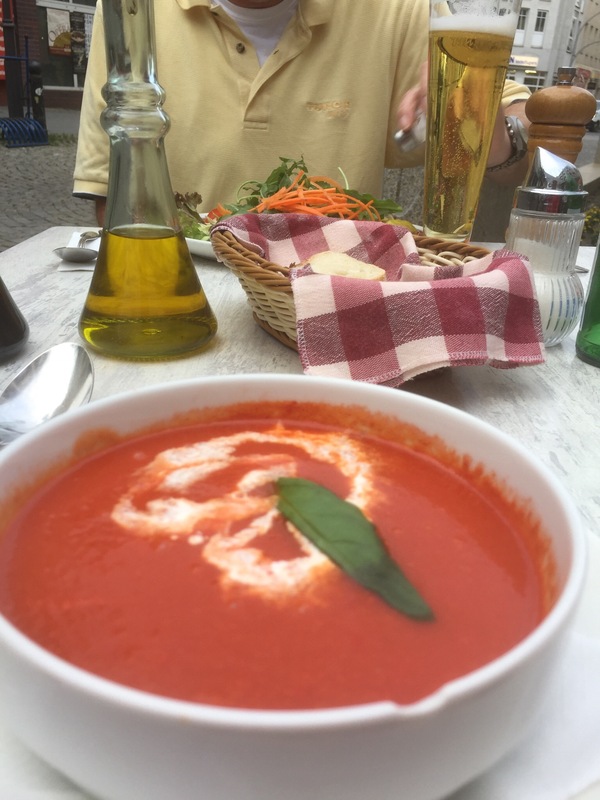 We didn’t fancy that again, and decided instead to do the hotels official detour via Goldenbaum and then Carpin and Neustrelitz. It would be further but we couldn’t quite tell how much. We set off at just past nine and were pleased to see that the beginning of the track was asphalted. The woman at the hotel had told me it was cobbled so this seemed a surprise. 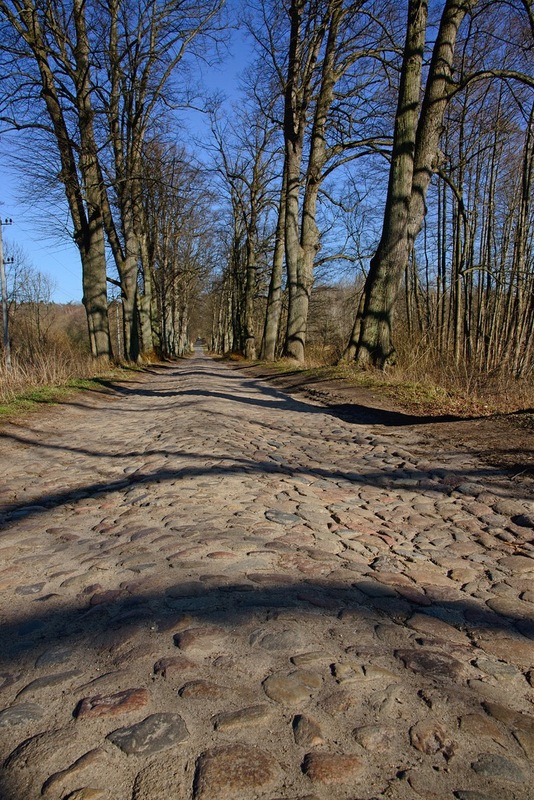 But soon enough we realised she was right, we turned out of the long driveway of the hotel onto a main Kreisstraße and discovered that it was this road, 5 kilometres long, which was cobbled. I didn’t have the energy to take a photo of this whilst being jiggled about but here is one I found on the Internet which looks very similar. 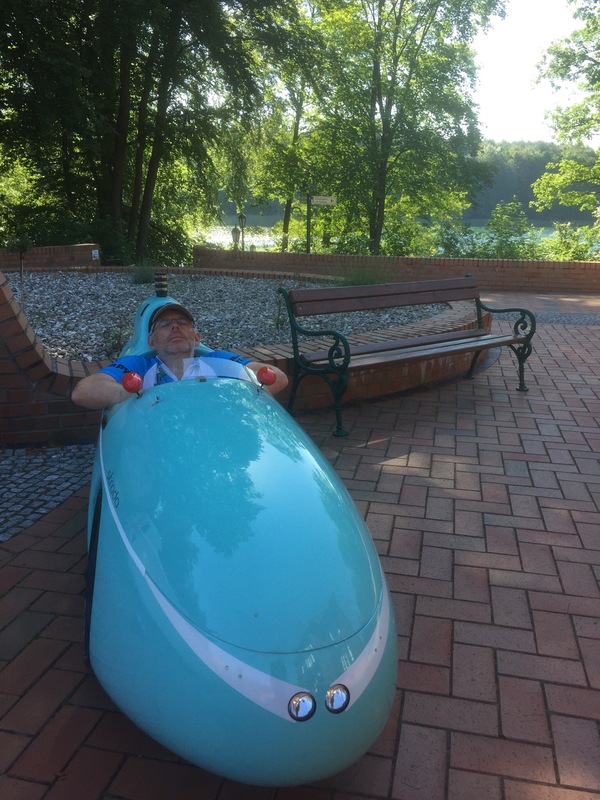 You can see how much fun we had in our Velomobiles, although fortunately there was a strip to the side which was a bit smoother and we mostly used that. We did have to dodge a lot of potholes though. This road we were was 5 km long but fortunately after about three kilometres the surface improved and became normal tarmac. 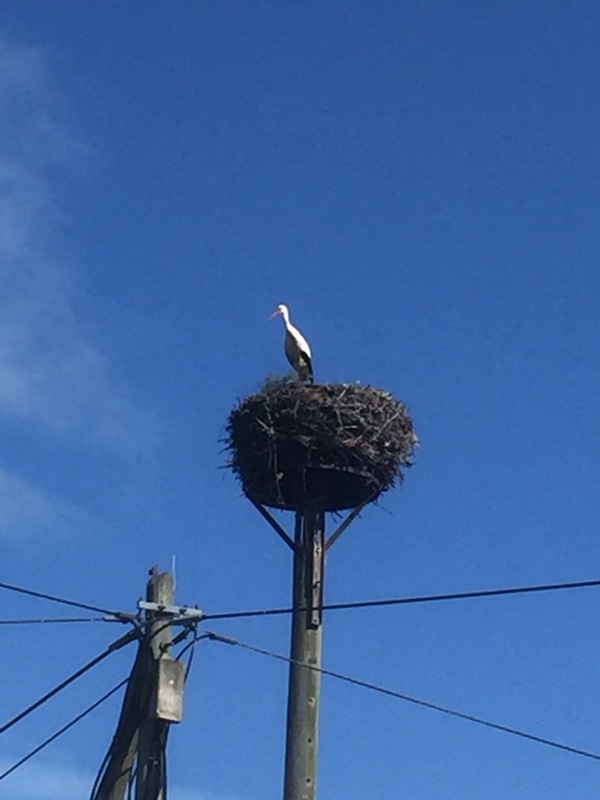 We rode through the village of Goldenbaum and Klaus spotted a stork on its nest. It watched us very closely indeed! (In this photo it is peering at Klaus). Just a mile later, as I was ahead, I rounded a corner and saw a stoat running across the road. It was great to see yet another interesting piece of wildlife on this trip. We then joined a Bundesstraße and had the fun of riding with quite a lot of traffic, despite it being Sunday morning. I initially tried to join the cycle path but each time it had sections that were so steep (Klaus saw 12% at one point) I had to use my Schlumpf gear. This meant I was crawling up really slowly and overheating as it was a very hot day. I also found that the path went through some woody areas with so many pine needles on the floor that I lost traction, as well as pinecones being launched from my wheels to the surroundings or Millie’s underside. Klaus was doing okay on the cycle paths but for me they were slowing me down a lot and tiring me out too, so I went on the radio to him to say I would stick to the roads from now on. The roads were rolling up and down but I saw a maximum grade of 5% whilst road riding. We we were able to maintain a reasonable speed, although on the downhills I was faster than Klaus as he was on the cycle path and could not go as fast there is less room to manoeuvre at speed. At one point also he was having a nice run along the path and then it ended and launched him onto the road, but first of all he had to get out of the Velomobile to negotiate some Drängelgitter. This detour started to seem like a really long way, but eventually we reached the town of Fürstenberg where our current route intercepted the original route. A rough calculation of our distance to destination from our Garmin showed that the detour had been more than 10 km extra. 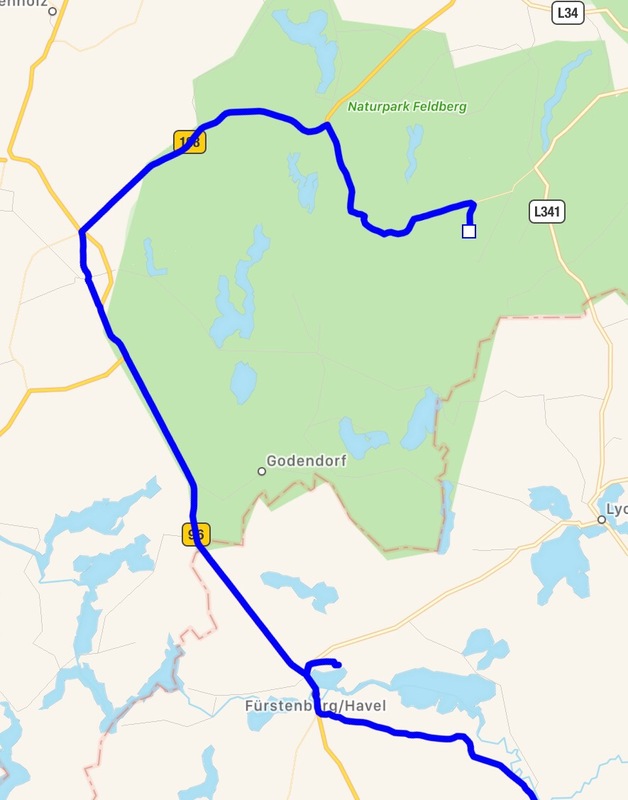 You can see it below, the original route went on the L341 and through Lychen. You can also see a little dead end on the track. 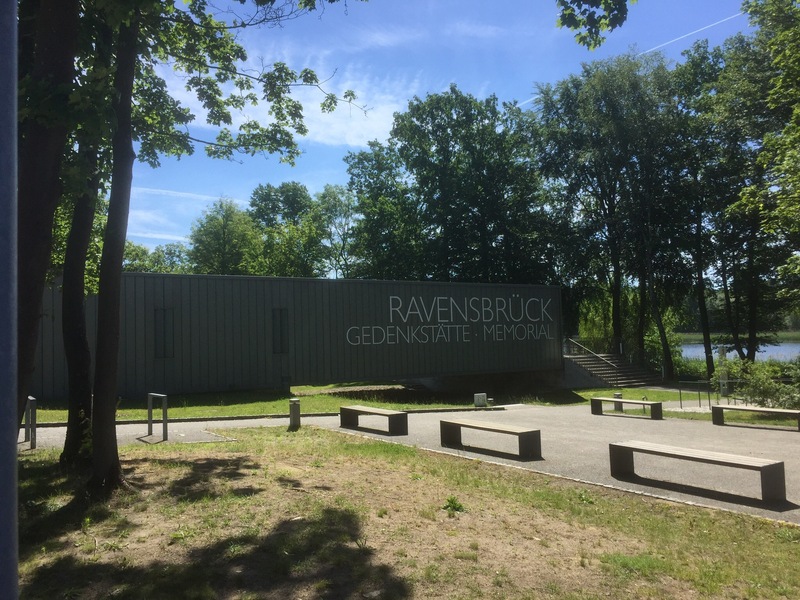 This was not a mistake, we decided to make a short 1.5km detour to visit Ravensbrück Concentration Camp memorial. When we arrived I saw lots of bikes parked up by one of the buildings and headed over to join them. Klaus took a different route, heading towards the main exhibition building, and was accosted by a man who told him we both had to park out the back with the cars. He was a bit of a jobsworth as we pointed out that the other bikes were elsewhere. “Yes but this is a special case.” So we left our bikes out of sight with all our luggage in and had a short look around. 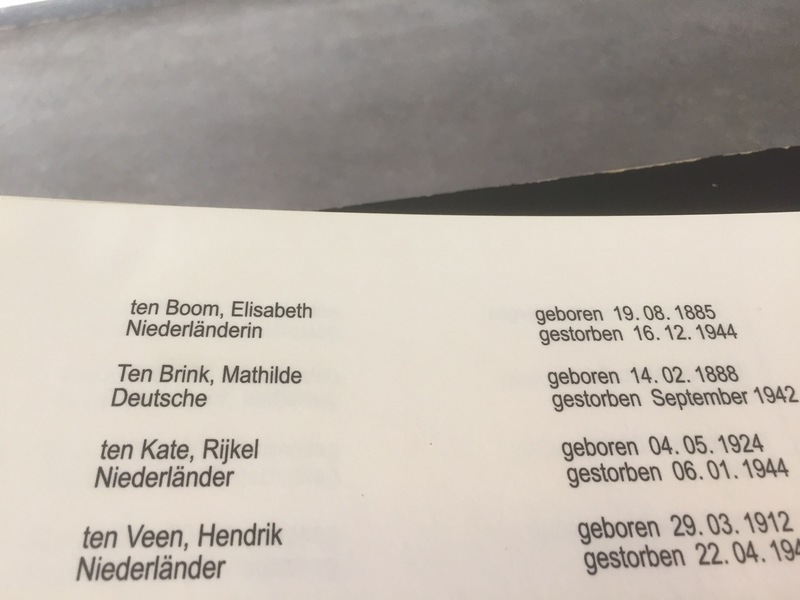 There was a room with a book with all the names of those who died at Ravensbrück and I found a name that will be familiar to many people, Betsy ten Boom. Her sister Corrie, who survived Ravensbrück, wrote a famous book ‘The Hiding Place’ about her wartime experiences. I found this small memorial very moving. When we got back to the bikes we discovered some mystery person had knocked the back light off the back of Millie. The batteries had fallen out and the cover was off but I put it together and it worked okay, fortunately. We headed off, having completed just 40 km of our 140. 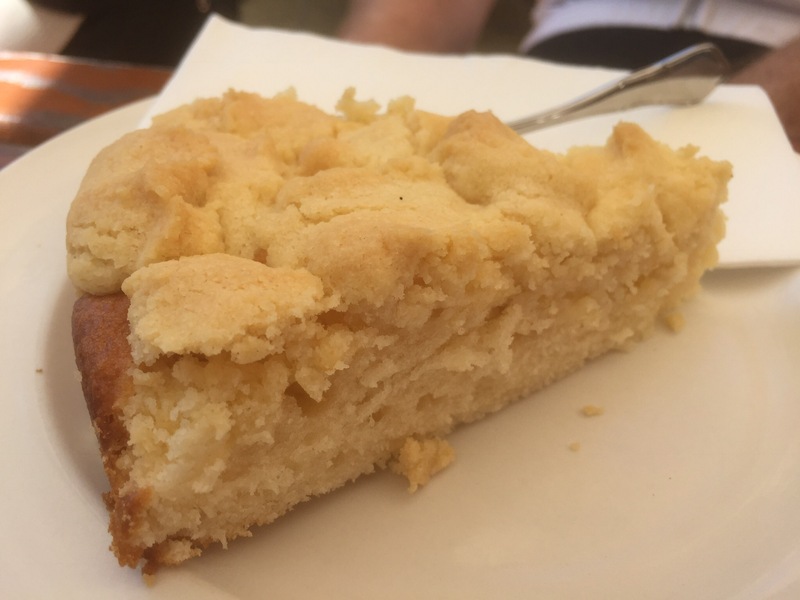 We would originally have had a cake break around 5 km later but decided to ride further as we had had a long break at Ravensbrück. We were finally off the busy Bundesstraße and onto quieter roads but the surface was quite poor in some places and it was also pretty hilly. Still, we made good time and were rolling with the hills, riding at a steady 30 to 35 km/h. 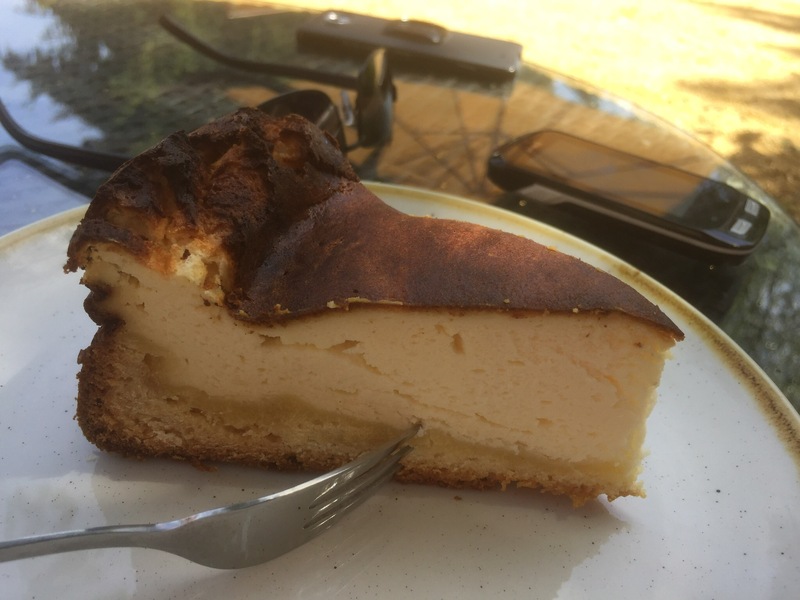 At about 60 km ridden we saw a water mill which had a cafe attached and stopped for some cheesecake. We were sitting on comfy chairs in the shade so lingered and I had 2 cups of tea. A man came to talk to us about our bikes and also gave us an information booklet about Oranienburg where he lives. 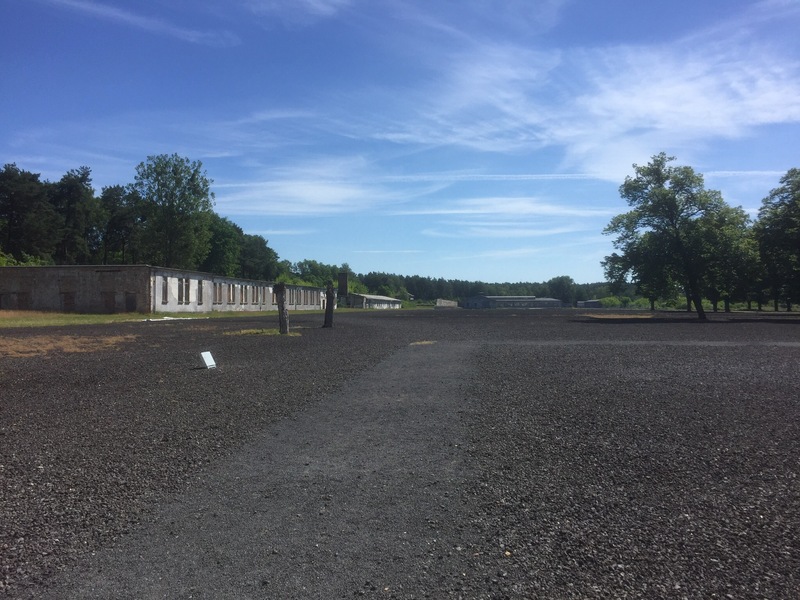 I have visited it previously as it is where Sachsenhausen concentration camp is. The cake had given us more energy, plus the route was flattening out a bit, so we zoomed ahead and covered lots of ground. At one point we both overtook a lady on a racing bike but she stuck very close to us for quite a while before we pulled ahead on a downhill. At a long red traffic light (because of roadworks) she caught us up again, and stayed with us for quite a long time after that before we eventually lost her. The marvels of Strava flyby tell us that she was doing a 175km ride – impressive on her own and in that heat! And with an average speed of 28km/h. For hot it was, the wind was like a hairdryer and the sun was beating down on our heads. 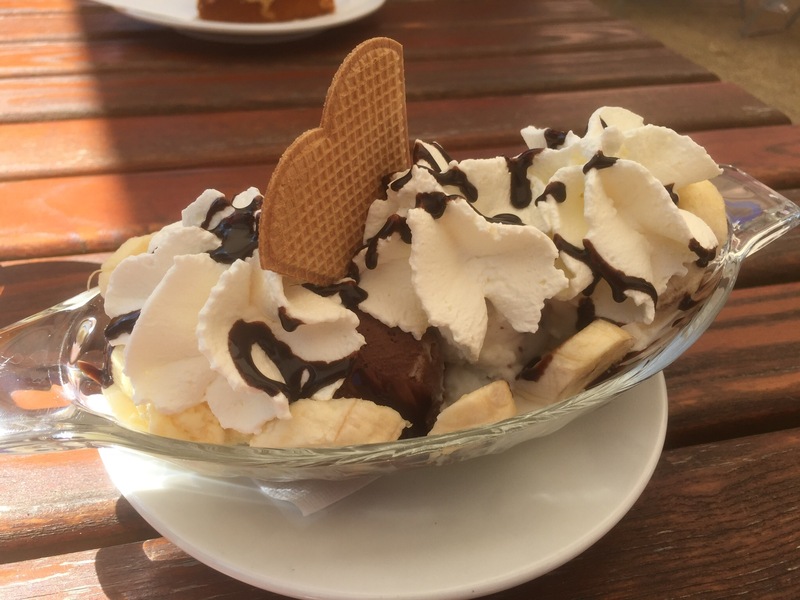 I suggested to Klaus that an ice cream would be a good plan and fortunately after 105 km ridden we found a very nice cafe. He went for the cake option. It was really hot so we had to re-apply suncream and also put Vaseline on our lips which were very dry and flaky now. We also topped up the water bottles as we knew we had not been drinking enough. From here we had just 37 km to reach our destination. Normally riding in a city is slow but we found the whole route until about 2 km before our hotel really fast. 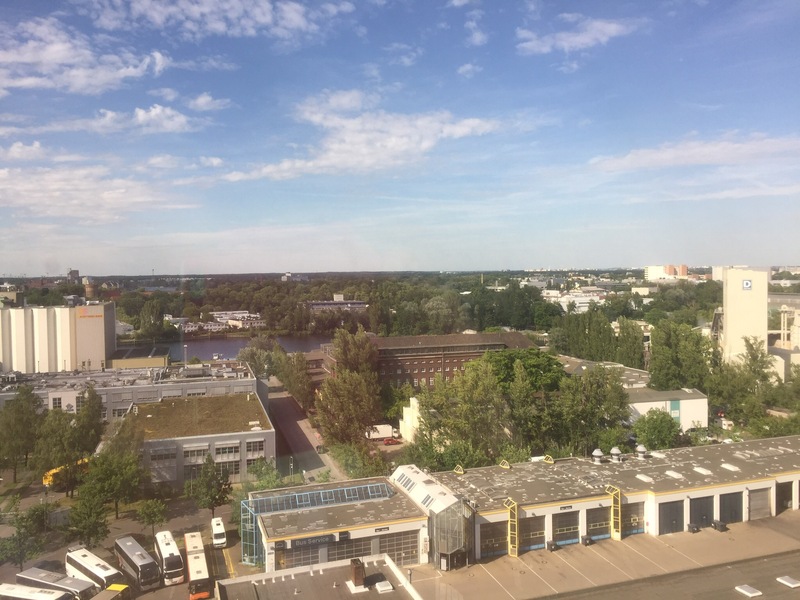 It helped that we were staying in Spandau which is to the west of the main city of Berlin, and we approached through open countryside to the north. Just after we passed under the Berliner Ring Autobahn (a bit like the M25!) a cyclist on a slightly unusual-looking fast bike drew up alongside Klaus. They proceeded to ride together and talk, sometimes at a speed of 45 km/h! This guy had previously made some recumbent bicycles himself, and was really thrilled to see some Velomobiles in the flesh. When Klaus eventually left him behind the chap stopped and waited for me to pass, filming me with his phone and waving at me. The final run into Spandau was great fun. There was a decent on road cycle path for the last 5 km and traffic was relatively light. We got stuck half a kilometre from the hotel as there was a street festival and the road was closed, but found an alternative route and soon arrived at our hotel. 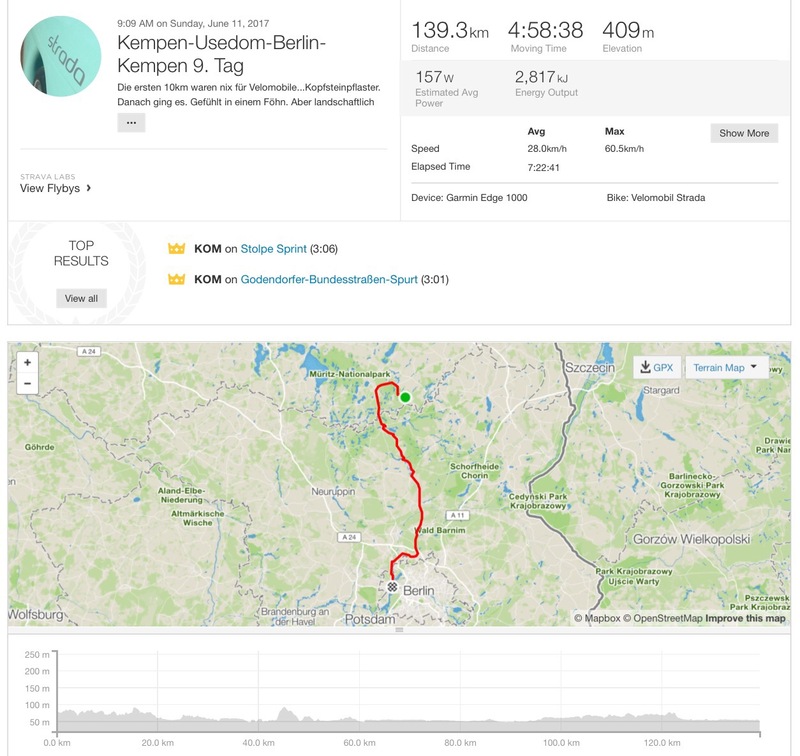 Here is Klaus’s Strava upload for the day. 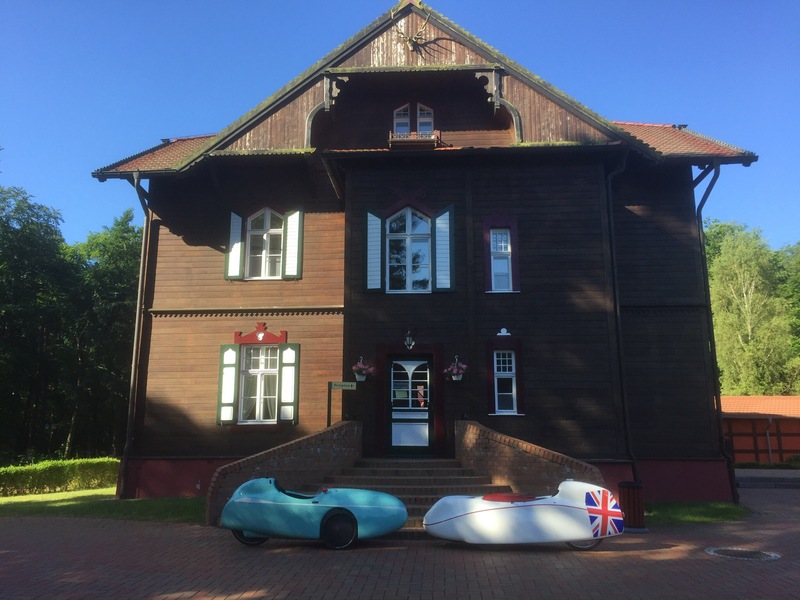 Hier unsere Tour nach Berlin-Spandau. Am Anfang haben uns 10km Kopfsteinpflaster und schlechter Strassenbelag ziemlich ausgebremst. Danach könnten wir es aber wieder fliegen lassen. 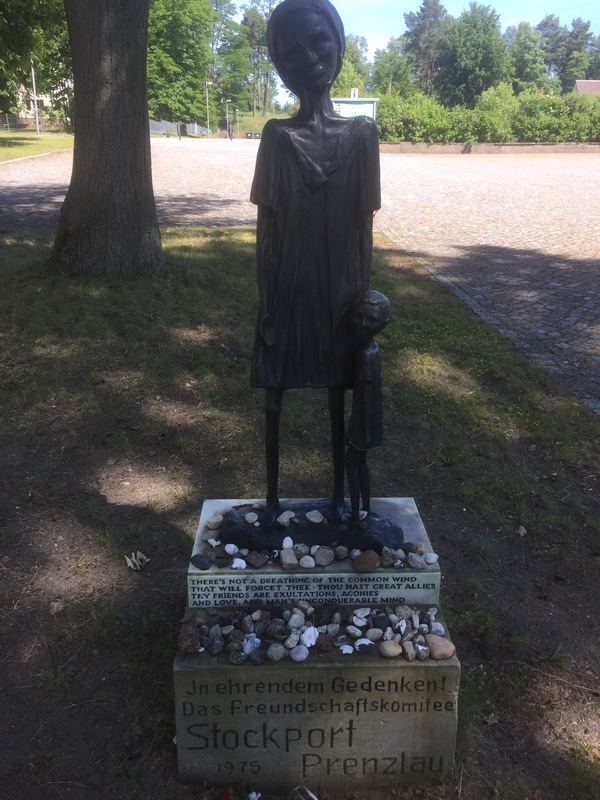 In Fürstenberg haben wir an der Gedenkstätte KZ Ravensbrück innegehalten. Etwas melancholisch fuhren wir weiter. Unterwegs gab es jede Menge “Gegend” zu sehen. Mir gefällt es hier unterwegs gaben wir eine Rennradlerin überholt. Sie ging unser Tempo sehr gut mit und wenn ich nach Strava gehe, ist sie heute 173km unterwegs. Kurz vor Berlin habe ich mich über einige Kilometer mit einem Rennradler unterhalten. Er ist total begeistert von den Velomobilen und ist früher selbst Liegerad gefahren. Die letzten Kilometer vergingen wie im Flug und so hatten wir am Ense einen 28er Schnitt trotz des “müden” Starts. aus den geplanten 123km wurden am Ende 139km…das war der Umleitung und dem Besuch des KZs geschuldet. 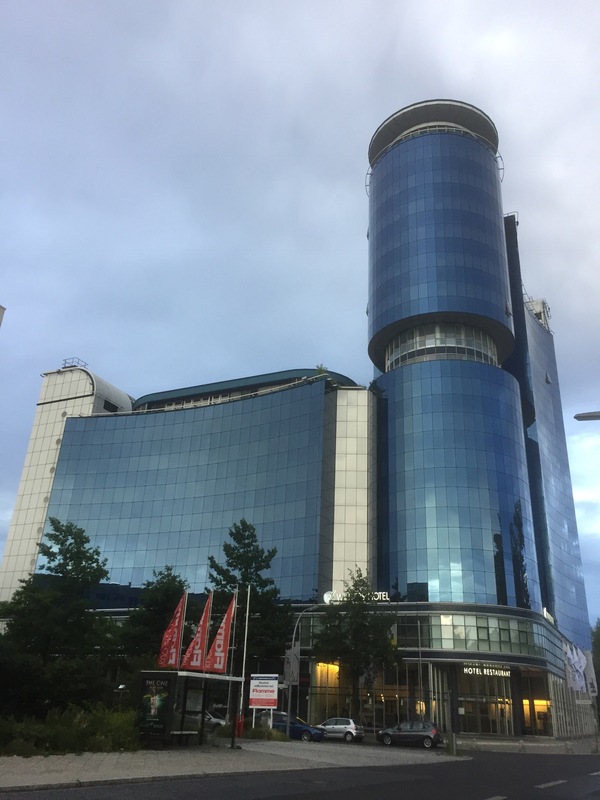 And this was our hotel… a very interesting building! 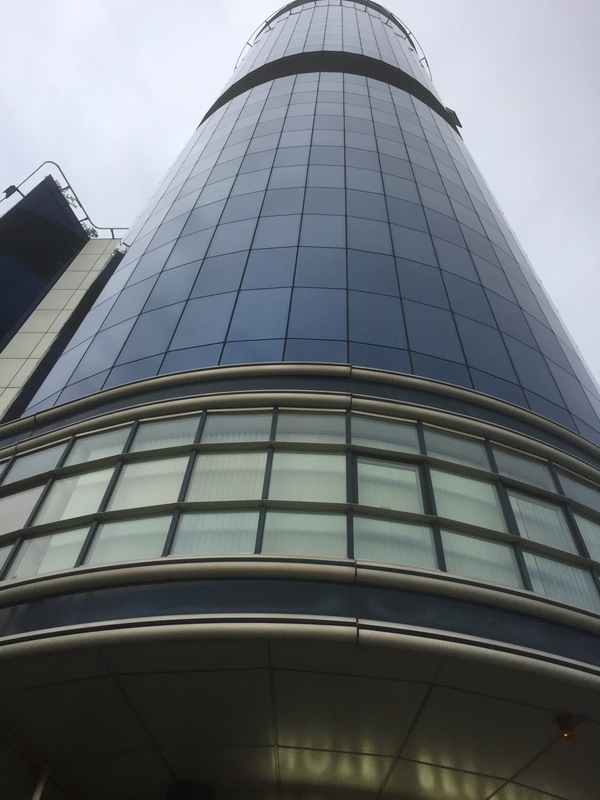 The view from our room on the 11th floor was pretty impressive too! We put the velomobiles in the underground carpark, and will actually have to pay for the car parking space they are utilising. Considering the car park was almost empty that seemed a bit rich but that’s life. They will be safe. 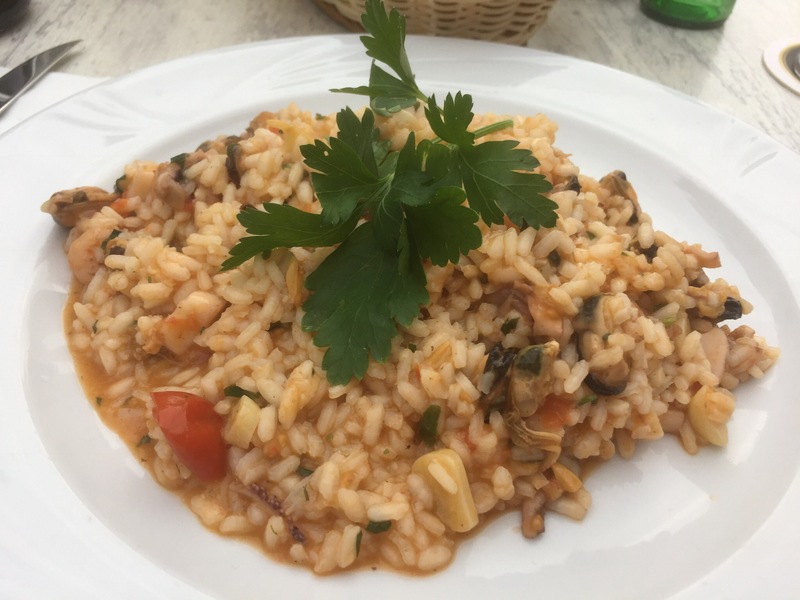 We walked into the main part of Spandau which was just 500 m away and enjoyed an Italian evening meal. It rained whilst we were eating our evening meal, once again rain occurring after we had finished riding for the day. We have been so lucky with the weather. Tomorrow is another rest day. We have no main plans yet for the day but in the evening we will have a meal with Lars, son of my landlady, who lives in Berlin. We feel really proud to have made it to Berlin by pedal power alone. We have ridden in total 1148 km at an average speed of around 28 km/h. We have another five full days of riding in order to get back to Kempen but the really hilly days are past us now so it should be easier, although it has been easier than I thought over the last two days. 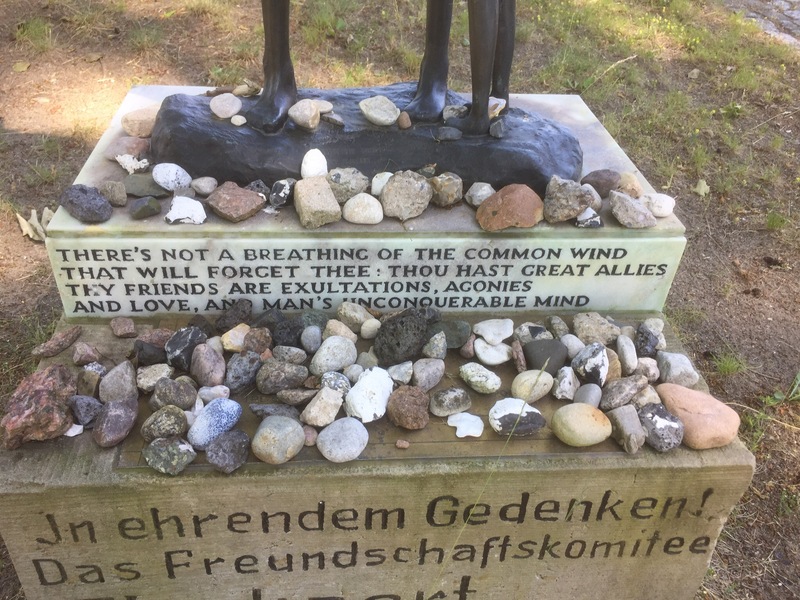 I hope you have enjoyed reading about our tour, we always appreciate comments left on the blog. I very much enjoyed reading so far. You are keeping an impressive average. With all the cakes, I believe you have enough fuel to burn.